One of my first ever pins on Pinterest was the plastic spoon / chrysanthemum mirror. 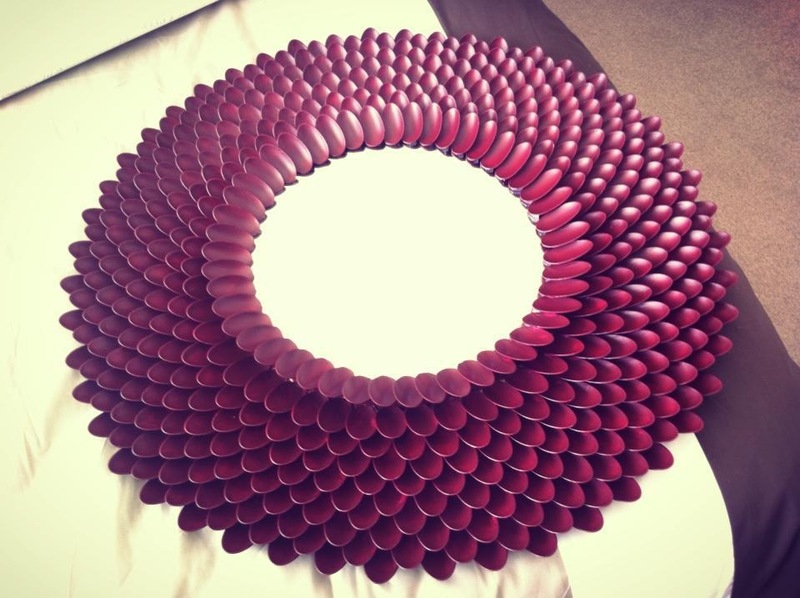 I honestly could not believe how ingenious it was to make a mirror out of plastic spoons! Here’s the original link, which has made it’s way around the interwebs thousands of times I’m sure. Some armed with some plastic spoons, 7mm wood, and 3 circle bevelled mirrors I got to making. I wanted to make 3 – 1 large one and 2 smaller ones for a particular place along our wall. I consulted Kristi’s instructions several times, but found that I sort of learnt along the way. I made the largest one first, pictured below, to get the hardest one out of the way first. For anyone attempting to make this, I would say you’ll need waaay more spoons then you think you’ll need. I made the mirror based on the mirrors that I could find, which ended up coming from eBay. Had I follow Kristi’s instructions to the T, then I probably wouldn’t have needed to make +5 trips to the shops on seperate occasions. I’ll try and take a photo of all 3 to show you guys. They look brilliant and we get comments on them every time we have friends and guests over. Lots of people can’t believe this was made from spoons, and so price effective at that! Pingback: DIY spoon mirror – update! | crosstitchery. Pingback: Plastic Spoon Mirror – Devil in the Details | crosstitchery. That is a fantastic mirror! It looks like a beautiful flower. Great job!